801-787-1668. 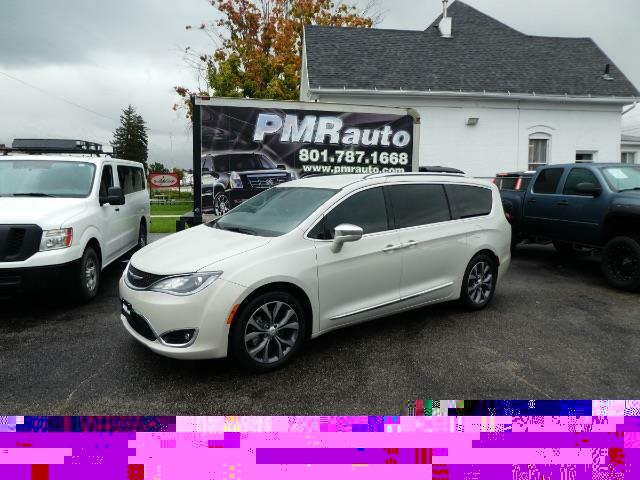 Stunning White 2017 Chrysler Pacifica Limited. Clean Title. Harman Karden stereo, dual dvd, navigation, and much more. Full Features Include:Bluetooth Wireless, AM/FM/HD Radio, Side Air Bags, Dual Power Seats, Leather, HID Headlamps, Daytime Running Lights, Cruise Control, Navigation System, ABS (4-Wheel), Electronic Stability Control, Tilt & Telescoping Wheel, Keyless Entry, Rear Park Assist, Backup Camera, F&R Head Curtain Air Bags, Privacy Glass, Dual Air Bags, Power Steering, Power Liftgate, Traction Control, Connect 3, Power Windows, Air Conditioning, Alloy Wheels, Fog Lights, Sun Roof (Sliding), Alarm System, Knee Air Bags, Power Sliding Doors, Hill Start Assist, KEYLESS-GO, Premium Sound, Rear Air Conditioning,, Blind-Spot Alert, Heated & Ventilated Seats, Power Third Row, Power Door Locks, Quad Seating (4 Buckets), SiriusXM Satellite, DVD System YES! balance of manufacturers warranty fully-transferable at no cost to buyer from estimated start date of 10/2016: Basic: 36 months / 36,000 miles Powertrain: 60 months / 100,000 miles Rust: 72 months / 80,000 miles Price listed is INTERNET PRICE ONLY. Tell us you saw it on the Net. PMR Auto -- RIDE IN STYLE. Vehicle has a certified, clean & clear title. Free Carfax available for review upon request. Prospective buyers are welcome to perform a pre-purchase mechanical inspection.